Apr. 3, 2019: Work is under way at the former Morgan Manhattan Storage building at 100 Pondfield Road in Bronxville. According to Paul Taft, village building inspector, onsite activity such as the erection of scaffolding on the building exterior pertains only to pre-construction safety measures, not to the conversion of the three-story building into eleven luxury condominiums with fourteen first-floor covered parking spaces. Taft said that the village has issued permits only for safety measures that must be in place before actual demolition and construction can begin. A permit has been issued for interior electrical work to install temporary lighting. Taft said he expected tasks and installations related to street safety measures to begin during the week of March 25. “All safety components must be in place before construction can begin,” he stated. According to Taft, the building department is waiting to receive permit information from construction subcontractors. “The project has taken so long to get started that much of the work is having to go out for rebid,” he said. Real estate developers Blauners LLC purchased the property in 2010 with a view to creating a luxury residential property. They made their first application to the Bronxville Planning Board in March of 2012 and experienced significant delays in obtaining approval for the plan. Although the building is zoned Central Business A, which allows for residential use, of primary concern to the board was its landlocked condition, which provides access via a single alley slightly over fifteen feet wide. Several board members also expressed concern about pedestrians, especially Bronxville School students, having to contend with traffic entering and exiting the property over a busy sidewalk. After many plan revisions and deliberations, the planning board approved the application under the name of Pondfield Court LLC in April of 2016. A spokesman from Blauners LLC stated that the company no longer owns the building and will not be a party to the conversion. “We sold that building some time ago,” he stated. Metro Realty Dividend Fund LLC of the Bronx purchased the property in March of 2017, per Brandon Yasgur, certified property manager and vice president at YRC Management–Realty Group. “It took me nineteen months to get a permit,” he said, and added that the only plan the village will permit is the original eleven-unit plan. The units, however, will be rentals rather than condominiums. Yasgur stated that a sidewalk bridge, a covered walkway designed to shield pedestrians from construction hazards, has been installed. He expects interior demolition on the building to begin the week of April 1. 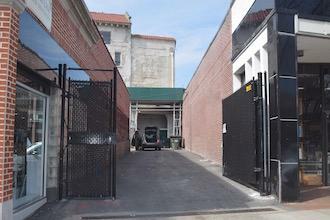 A chain link gate has been erected over the driveway and, according to a representative from Bronxville Wines & Spirits and Topps Bakery, those businesses still have access to the driveway for deliveries but can no longer use it for parking. Pictured here: A view of 100 Pondfield Road from the street.